The episode emerged last week when Jean-Luc Mélenchon, a far-left firebrand, mocked a reporter with an accent from south-west France. “What does that mean?” he snapped, imitating the journalist’s Occitan twang; “Has anyone got a question phrased in French, and which is more or less comprehensible?” His put-down was as bizarre as it was offensive. The Paris-based Mr Mélenchon is a member of parliament for Marseille, a city known for its Provençal lilt. 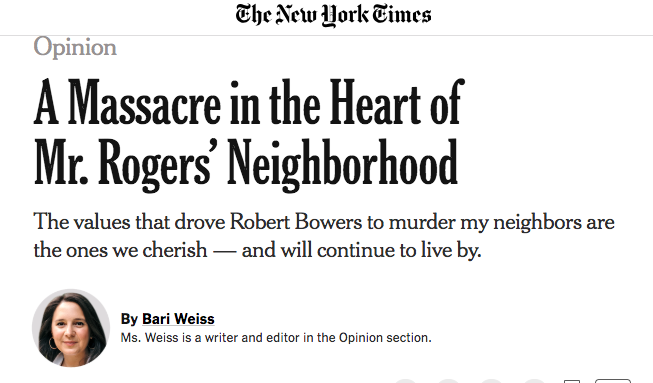 The subhed of this opinion piece made me do a double take — Bari Weiss, "A Massacre in the Heart of Mr. Rogers’ Neighborhood: The values that drove Robert Bowers to murder my neighbors are the ones we cherish — and will continue to live by", NYT 10/27/2018. 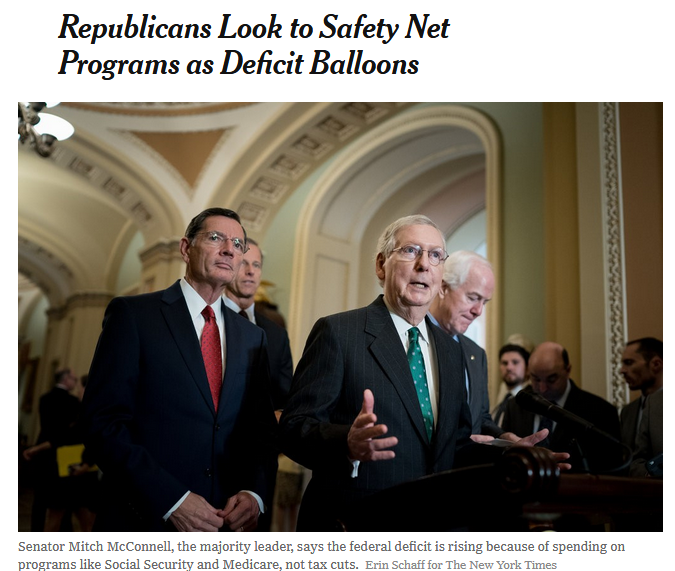 This is an interesting, informative article, from which I learned much, including the PIE root for "goose", and the fact that geese can fly as high as 30,000 feet! The Mexican City of… WHAT? … or more generally, "X Occupied Y", where X is something Jewish, and Y is something governmental. Zionist occupation government, Zionist occupational government, or Zionist-occupied government (abbreviated as ZOG) is an antisemitic conspiracy theory that claims "Jewish agents" secretly control the governments of Western states. Other variants such as "Jewish occupational government" are sometimes used. The expression is used by white supremacist, far-right, nativist, or antisemitic groups in the United States and Europe, as well as by ultra-nationalists such as Pamyat in Russia, and various far-right groups including the Freemen, Identity Christians, Odinists, and Ku Klux Klan. So Farrell's phrasing choice ("Soros occupied State Department") is not so much a dog whistle — "A political allusion or comment that only a certain audience are intended to note and recognize the significance of" — as a straight-up fascist salute. In Trump’s recent remarks on the Squirrel Hill synagogue shooting, he (at ~1:12 in the linked video) refers to the shooting taking place “on the holy day of Sabbath”, pronouncing “Sabbath” in a bizarre way, with the vowels completely off. My best guess—and a few people on Twitter seem to agree— is that the teleprompter actually said “Shabbat”, but Trump was unsure how to pronounce it, and ended up saying “Sabbath”. Still, it seems a bit strange since Shabbat is not a particularly hard word to read phonetically, and given that Trump’s daughter and son-in-law are shomer shabbos, one would think he had heard the word before. It’s equally possible that Trump didn’t know the word “Sabbath” and was trying to give it a “Jewish” pronunciation, and thus over-corrected. One more reason for me to love Wikipedia. I just noticed in this article on Chinese honorifics that some example sentences are phonetically annotated with Pinyin. Not only that, it observes properly spaced word division, which must be technically difficult to achieve. Furthermore, the Pinyin annotations are appropriately small, yet clear. I don't know how widespread this usage has become in Wikipedia or elsewhere, but I can tell you that learning about it this morning brought me great joy. The [Vietnamese] government often sends out mass text messages with announcements to every number in the country with no diacritics at all. Furthermore, teenagers have grown up to text toneless and abbreviated with no issues, and now it's common to see things like "Hn 2 vc mun dj choj oh cv thog nhat vs cac p dog nghiep hem?" It was lovely and moving, especially Bishop Gene Robinson’s homily, but I couldn’t help remarking his folk-seminarian (I assume) etymology for “anamnesis”. He explained it as “an-“, against, and “amnesia”, forgetting. Seminarians would learn it in the context of holy communion. 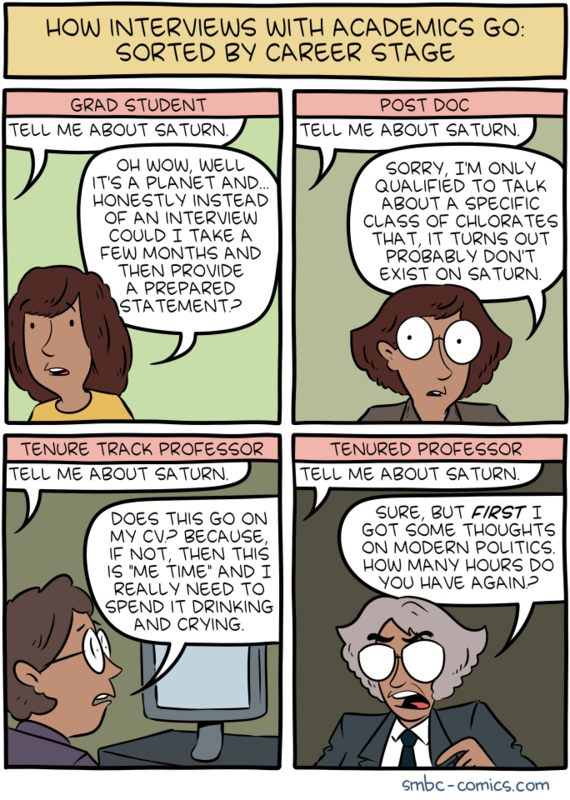 I can see the appeal of that explanation. It leads to the right sense of the word, or close enough, and is more poetic, less clinical somehow, than ana-mnsesis would be. Mouse-over title: "The emeritus will take 4 hours telling you about a trip to Africa that happened 40 years ago." 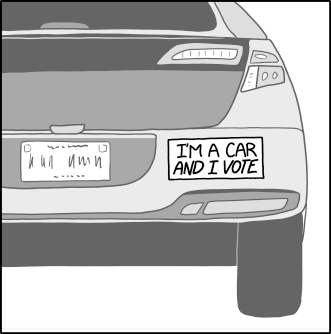 Mouseover text: "I'm the proud parent of an honor student, and the person driving me is proud, too!"